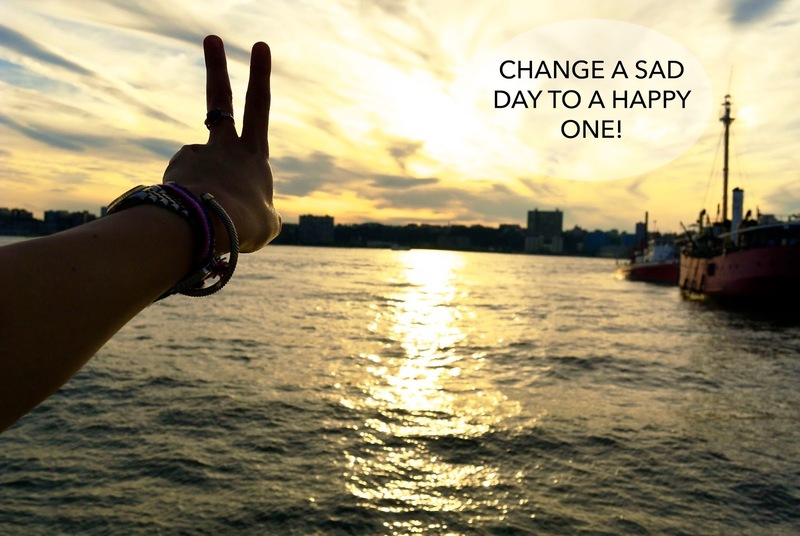 Miss Singh: CHANGE A SAD DAY TO A HAPPY ONE! CHANGE A SAD DAY TO A HAPPY ONE! We all have those crappy or sad days where we go through stuff we don’t expect. But life happens, and all we can do is move forward! Whether its school pressure, family issues, breakups, bad jobs, a loss of someone or anything else, we all have problems in life, but there are some small ways to make yourself feel better. Here are some of my easy and quick tips that make me change a sad day into a happy one! This is an important one. I know when we are sad and upset, all we want to do is lay in bed, watch sad movies and eat all the chocolate and ice cream we can, but getting out of bed is the first and most important step. Make the bed, leave all that chocolate and let's get on with the day! It depends on you if you like to take a shower or bath, but this step will help you refresh and re-energize! Try using a refreshing zingy face wash, like Orgins Ginzing Scrub Cleanser. If you enjoy baths, use relaxing bath salts like the Lavender Bath Salts by Ahava or a fun bath bomb from Lush like the Dragons egg. Use a face mask that’s hydrating, like the Origins Drink Up Intensive Mask. The scents around you can really affect your mood, which is why I believe candles are a great option! Try burning some relaxing candles. I like the Aromatherapy Eucalyptus Spearmint by Bath and Body Works. When I am sad I need to keep myself busy. I usually like to blog, take a walk or clean my apartment. Find something, like an activity, that will take your mind off the issues taking place. I have noticed exercising and yoga can really make one feel better about themselves and it can relax you! If you like crafts or DIY projects, try starting a new one! After dealing with all the negative, try making a list of the positive things in life. There is always, ALWAYS one good thing in your day or life and writing that down can really help canceling the negative and seeing the positive. Keep a diary or journal and write these positive things! If you don't want to write them down, think about them in your head. I have just noticed writing the good stuff has helped me a lot. Meeting up with friends and family your close to can always help. You can also talk to your close ones about the issues, your feelings, which can really help because letting it all out instead of keeping everything bottled up is a better way to cope with problems. I love talking to my mom! She makes all the bad go away! This helps me a lot! I am all about music when it comes to fixing up my mood. Find some new music or just any music that makes you happy(Keep away from the depressing songs)! Music is such a perfect way to soothe yourself and your mind. Make a Spotify playlist! Try to notice those little things in life that can cheer you up! For me, it’s my dog Zepplin! He just knows when I’m sad and just playing and cuddling with him really helps me! It’s such a little thing but it helps! Find those little things for yourself! Even though they may seem stupid at the time, these little things help a lot! This is quite a unique one and works over time. Over the years, I have started to appreciate what I have more. Just look around! There is so much worse out there, which make our issues seem much smaller. A situation could have been worse and there is so much worse out there so try to keep that in mind. I am no expert, but these little things help me cope with some crappy days and I hope they help you too! If you are having a bad or sad day, I send you a big hug! Remember, tomorrow is a new day, stay positive and everything will be okay! Come say hi to me on Twitter and follow me on my other social media if you want. This was so inspiring! When I'm having a bad day I like to write down all of my frustration. It helps me release all the bad things and focus on all the positive things in my life! I did a post about positivity a few weeks ago and would love for you to check it out! Thank you! :) I am glad you enjoyed the post and it inspired you! I will check yours out too! Jessica! Same here! Music changes my mood every time! :) I am glad you liked the list! Have a good one!